In the DNA Structure and Replication we will extend our knowledge on the DNA Structure from Topic 2.6. This unit will also focus on the individuals responsible for the discovery of the DNA helix and proving that DNA is the genetic code. ​This unit will last 3 school days. 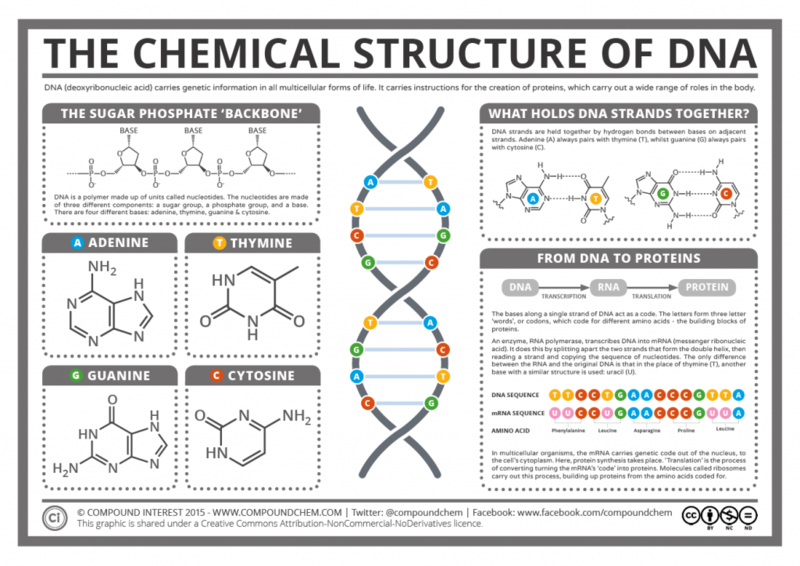 The structure of DNA is ideally suited to its function. Describe Rosalind Franklin’s role in the elucidation of the structure of DNA. 7.1​ U1 Nucleosomes help to supercoil the DNA. ​​​Draw and label the structure of a nucleosome, including the H1 protein, the octamer core proteins, linker DNA and two wraps of DNA. Explain the levels of supercoiling (DNA→ nucleosome → beads on a string → 30nm fiber → unreplicated interphase chromosome → replicated metaphase chromosome). DNA is arranged in chromosomes in eukaryotes. Each chromosome contains one very long DNA molecule. Packaging of DNA is necessary. For example, in each human cell there is approximately 2m of DNA distributed between 46 chromosomes, yet the average diameter of each cell is only 10–30µm. A packaged unit of the chromatin fibre is called a nucleosome, which looks like a bead on a thread. another type of histone, called H1, that binds the DNA to the central ‘bead’. There is a short segment of naked DNA between each nucleosome. This is known as linker DNA. 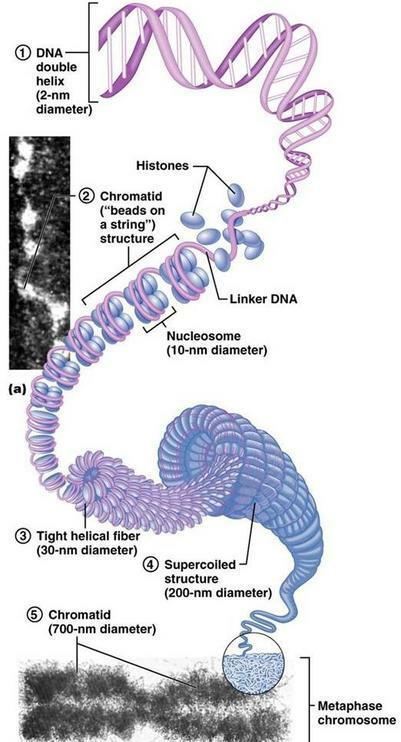 The nucleosomes arrange into coils, and in preparation for nuclear division, the coiled structure coils up again, to form a supercoiled chromosome.. Nucleosomes are important for the safe storage of DNA. They also play an important role in the regulation of transcription. 7.1 U 2​ DNA structure suggested a mechanism for DNA replication. (Details of DNA replication differ between prokaryotes and eukaryotes. Only the prokaryotic system is expected) (Oxford Biology Course Companion page 347). ​Outline the features of DNA structure that suggested a mechanism for DNA replication. DNA is double stranded and shaped like a ladder, with the sides of the ladder made out of repeating phosphate and deoxyribose sugar molecules covalently bonded together. Each deoxyribose molecule has a phosphate covalently attached to a 3’ carbon and a 5’ carbon. The phosphate attached to the 5’ of one deoxyribose molecule is covalently attached to the 3’ of the next deoxyribose molecule forming a long single strand of DNA known as the DNA backbone. DNA strands run antiparallel to each other with one strand running in a 5’ to 3’ direction and the other strand running 3’ to 5’ when looking at the strands in the same direction. The rungs of the ladder contain two nitrogenous bases (one from each strand) that are bonded together by hydrogen bonds. Purines are two ring nitrogenous bases and pyrimidines are single ring nitrogenous bases. The nitrogenous bases match up according the Chargaff’s Rules in which adenine (purine) always bonds to thymine (pyrimidine), and guanine (purine) always bonds with cytosine (pyrimidine). Compare replication on the the leading strand and the lagging strand of DNA. Explain why replication is different on the leading and lagging strands of DNA. Outline the formation of Okazaki fragments on the lagging strand. ​The DNA polymerases are enzymes that create DNA molecules by assembling nucleotides, the building blocks of DNA. These enzymes are essential to DNA replication and usually work in pairs to create two identical DNA strands from one original DNA molecule. During this process, DNA polymerase “reads” the existing DNA strands to create two new strands that match the existing ones. Every time a cell divides, DNA polymerase is required to help duplicate the cell’s DNA, so that a copy of the original DNA molecule can be passed to each of the daughter cells. In this way, genetic information is transmitted from generation to generation. Before replication can take place, an enzyme called helicase unwinds the DNA molecule from its tightly woven form. This opens up or “unzips” the double stranded DNA to give two single strands of DNA that can be used as templates for replication. DNA polymerase adds new free nucleotides to the 3’ end of the newly-forming strand, elongating it in a 5’ to 3’ direction. However, DNA polymerase cannot begin the formation of this new chain on its own and can only add nucleotides to a pre-existing 3'-OH group. A primer is therefore needed, at which nucleotides can be added. Primers are usually composed of RNA and DNA bases and the first two bases are always RNA. These primers are made by another enzyme called primase. 7.1 U 4 ​DNA replication is continuous on the leading strand and discontinuous on the lagging strand. (Oxford Biology Course Companion page 349). Outline the role of the following proteins in DNA replications: helicase, topoisomerase (AKA gyrase), single stranded binding proteins, primase, DNA polymerase III, DNA polymerase I, and DNA ligase. 7.1 U 4 ​DNA replication is carried out by a complex system of enzymes. (Details of DNA replication differ between prokaryotes and eukaryotes. Only the prokaryotic system is expected. The proteins and enzymes involved in DNA replication should include helicase, DNA gyrase, single strand binding proteins, RNA primase and DNA polymerases I and III. DNA replication creates two identical strands with each strand consisting of one new and one old strand (semi-conservative). DNA replication occurs at many different places on the DNA strand called the origins of replication (represented by bubbles along the strand). Explain the need for RNA primers in DNA replication. Explain what is meant by DNA replication occurring in a 5' to 3' direction. Genes contained within DNA called coding sequences, code for polypeptides created during transcription and translation. The majority of DNA are non-coding sequences that perform other functions such as regulators of gene expression, introns, telomeres and genes for tRNAs. The regions of DNA that do not code for proteins should be limited to regulators of gene expression, introns, telomeres and genes for tRNAs. Outline the process of X-ray diffraction. Outline the deductions about DNA structure made from the X-ray diffraction pattern. Rosalind Franklin and Maurice Wilkins used a method of X-ray diffraction to investigate the structure of DNA. they were able to determine some helical dimensions using x-ray diffraction. X-ray diffraction patterns are regular, therefore, helix dimensions must be consistent. Explain why VNTR are used in DNA profiling. Dideoxyribonucleotides inhibit DNA polymerase during replication, thereby stopping replication from continuing. Dideoxyribonucleotides with fluorescent markers, are used and incorporated into sequences of DNA, to stop replication at the point at which they are added. This creates different sized fragments with fluorescent markers that can be separated by gel electrophoresis and analyzed by comparing the color of the fluorescence with the fragment length. 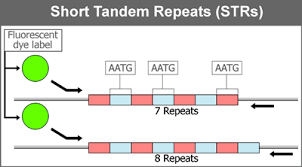 7.1 A 3 ​Tandem repeats are used in DNA profiling. For example, CATACATACATACATACATACATA is a STR where the nucleotide sequence CATA is repeated six times for one individual. However, in another individual, this tandem repeat could occur only 4 times CATACATACATACATA. These variable tandem repeats are the basis for DNA profiling used in crime scene investigations and genealogical tests (paternity tests). The diagram below shows how the different number of these alleles for the VNTRs are used to create a DNA fingerprint of an individual. State the experimental question being tested in the Hershey and Chase experiment. Explain the procedure of the Hershey and Chase experiment. 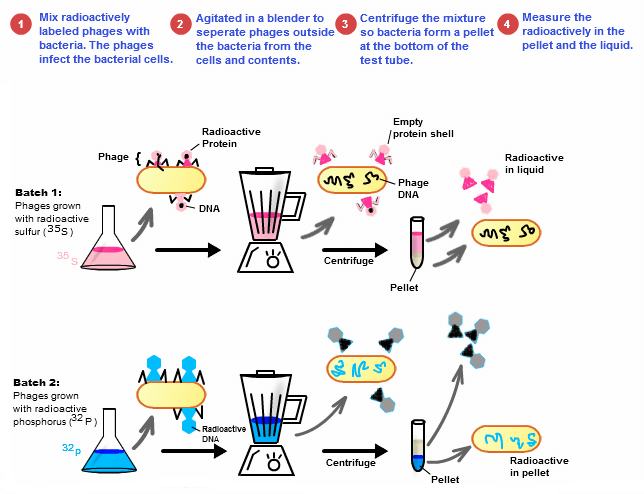 Explain how the results of the Hershey and Chase experiment supported the notion of nucleic acids as the genetic material. Identify nucleosome structures using molecular visualization software. Outline the mechanism of histone-DNA association. Highly repetitive sequences were once classified as “junk DNA” showing a degree of confidence that it had no role. To what extent do the labels and categories used in the pursuit of knowledge affect the knowledge we obtain? ​Rosalind Franklin was a British scientist who helped discover the structure of DNA, but you most likely haven't heard of her. Hank will attempt to fix this gap in your knowledge on today's SciShow: Great Minds. The discovery of the structure of the DNA double helix was one of the most important of the 20th century. In this educational video, explore Watson and Crick’s quest to understand DNA’s structure, and Rosalind Franklin’s key insights via x-ray crystallography.